“Most CIOs I meet want my job,” Graeme Hackland agrees, chuckling. That’s not surprising: as IT director for Lotus F1 Team he has one of the most glamorous gigs on the circuit in a sport that fascinates many techies. But paradoxically, in the (quite literally) fast-moving world of F1, even staying put does not equate to stability and what is now Lotus has been through a bewildering series of changes of marque including Toleman, Benetton and Renault F1. Drivers in Hackland’s tenure have also come and gone, including world champs Fernando Alonso, Michael Schumacher and current pilot Kimi Raikkonen. Aerodynamics and engineering are the key differentiators in F1 but ICT is also critical; and moving and securing the data, intellectual property and CAD designs stored in computer files is central, ultimately, to Lotus’s position on the grid and in the championship. “It’s a huge part of what we do as a company and data management is the biggest challenge I face, knowing its safe and not in the wrong hands,” Hackland says. Testing and development never stop, whether using off-the-shelf programs or Lotus hand-rolled applications. Hackland describes F1 today as “a travelling circus that’s truly global” noting the way that it is no longer largely dependent on Europe and the Americas. Interest in the sport has never been higher and whether it’s a system that can run 10,000 race simulations in three minutes or a means of speeding up manufacturing, tech is behind most of Lotus’s success. The influence of IT extends from back-office processes all the way to the trackside where Lotus engineers receive 25MB of data per lap from the car’s 200 on-board sensors to inform race strategy. This is where Fast Data meets Big Data: a sea of information comes in on everything from track temperature to competitive information such as who is changing tyres. The challenge throughout is to “keep the car on the track and get more from it”. While in the old days, courses like Nürburgring (the ‘Green Hell’ in Germany’s Eifel mountains) and street circuit Monaco with its tall buildings, might have meant interruptions to that wireless data stream, today, coverage from the Riedel network is 100% on every track. Lotus’s race engineer can use this real-time network to advise the driver on when the car needs to come in for tyre changes, refuelling or other decisions. However, like any relationship, you have ups and downs. A driver like Alonso might be “chatty” but another like Raikkonen may be quieter and the latter certainly isn’t afraid to say when it’s a case of Too Much Information. A famous example of this occurred when, en route to winning in Abu Dhabi last year, the Finn told Lotus’s race engineer: “Leave me alone; I know what I’m doing.” The incident, played on TV all over the world, became a viral hit, even spawning T-shirts and other paraphernalia bearing the slogan. “I have that T-shirt,” Hackland laughs. “Sometimes drivers follow 100% and sometimes they don’t,” he says, adding that, while a race engineer might have a world of facts assembled, the driver might often have a superior sense of what the car needs. Making lessons learned from operating at the tightest margins of F1 available to motorists generally is something that Hackland thinks is important. As well as helping to get cars to the end of the race and ensuring optimal performance, those 200 on-board sensors to check everything from tyre pressure to brake wear and engine revolutions include technology that will be extensible to road cars. Also on Hackland’s mind are new rule changes that will test the creativity of constructors as, beginning next year, F1 teams will be forced to make a number of changes to engines and car bodies and will need to consume far less fuel. But it’s a challenge Lotus welcomes. 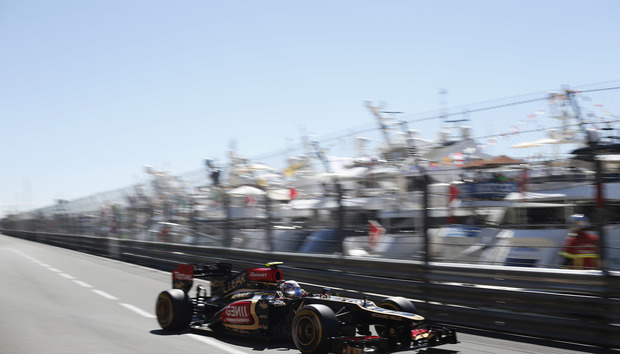 Lotus started working on the 2014 car in early 2012, effectively running three car projects in parallel. Hackland has assembled a stack of ICT suppliers to help work through this complexity, including EMC, Juniper Networks, Avanade for software development and Microsoft Dynamics for ERP. Spying on rivals’ designs has tainted the sport in the past and keeping data secure is never far from his mind. And with so many people moving from team to team in the F1 world, that means keeping data away from people who don’t need to know internally, as well as rivals and other outsiders. “It’s very clear that, no, [intrusive attempts to garner information are] not acceptable and the next one [found guilty] will be thrown out,” he says. However, Hackland is a private cloud enthusiast and can envisage at time when some race data could be exported to the cloud for fast analysis afterwards to let the team be instantly productive when not on the Lotus corporate network. The drive for efficiency is eternal. Lotus has about 87% of its server estate virtualised today and expects to increase that. The operation also has about 15 apps that run trackside and the IT operations cadence sees about five upgrades per race. Longer-term projects include a refresh of the network, a revamped ERP system and adoption of Vblocks compute/network/storage convergence technology from VMware, Cisco and EMC. The big target is to be world champion constructor by 2015 but, as ever in this most demanding and technical of sports, the race is already on.